(TORONTO) – Canadians know that when it comes time to purchase a compact pick-up that’s versatile, safe, and more powerful while using less fuel, the Tacoma leads the pack. The 2010 Toyota Tacoma line-up offers seven models all equipped with seven standard safety features, fuel efficient 4x2 and 4-cylinder models, or powerful and nimble 4x4 powertrains and V6 engines. 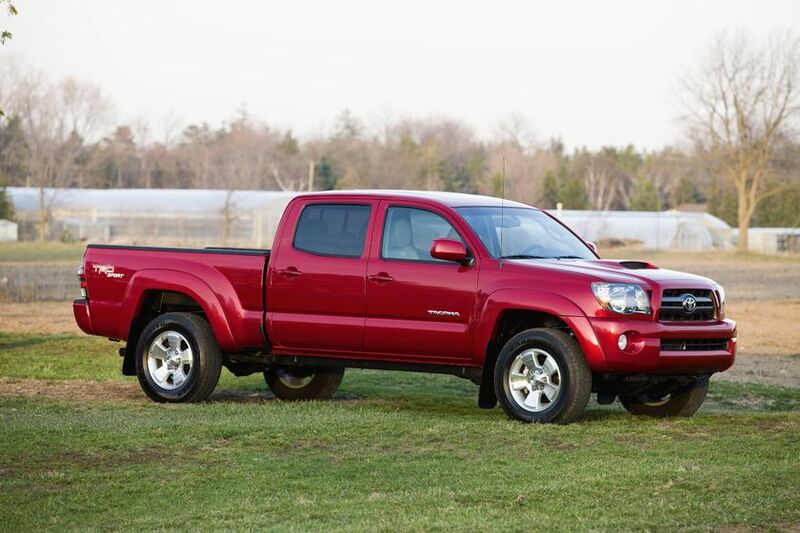 The 2010 Toyota Tacoma is available in seven models – two 4x2 models and five 4x4 models. A surprisingly powerful yet fuel efficient 2.7 Litre 4-cylinder engine is fitted to three models: the 4x2 Access Cab in 5-speed manual and 4-speed automatic, and the 4x4 Access Cab with a 5-speed manual. This engine delivers up to 159 horsepower, up to 180 lb-ft of torque, and a 1,587 KG (3,500 LB) towing rating. For additional power and towing capability, Toyota’s proven 4.0 Litre V6 is fitted to four models: The 4x4 Access Cab V6 and 4x4 Double Cab V6 in 6-speed manual and 5-speed automatic models. This engine generates up to 236 horsepower, up to 266 lb-ft of torque, and a towing rating of 2,268 KG (5,000 LB). Toyota Racing Development (TRD) packages, available for all V6-equipped models, boosts this to 2,948 KG (6,500 LB). Tacoma 4x4 Double Cab V6 (automatic) = 13.4L per 100 KM city/9.9L per 100 KM highway. Toyota’s Active Front Headrests with Whiplash Protection. Models with the Access Cab seat four adults in comfort and include a six-foot cargo bed. Models with the Double Cab seat five adults in comfort, with full-size doors for easy access to the rear seats, and include five-foot or six-foot cargo beds. Two speed wipers with mist feature; halogen headlamps; digital clock; tachometer; and more. Option packages respond to the needs of the broad array of pick-up buyers, from convenience items, to performance-enhancing specifications that all provide Canadian drivers with a value-driven and personalized Toyota Tacoma pick-up truck of their own..
Air conditioning is standard on all Tacoma 4x4 models, and available on Tacoma 4x2 models. All models may be ordered with Toyota’s SR5 Power Package, which adds convenience features such as cruise control, keyless entry, steering wheel-mounted audio controls, plus stylish touches like rear privacy glass, chrome rear bumpers and grille, and leather wrapped steering wheel and shift knob, and more. V6-equipped Tacoma models may be ordered with special Toyota Racing Development (TRD) packages. These add rugged capability, with upgraded engine and transmission components to enable a 2,948 KG (6,500 LB) towing capability, plus a Class IV weight distribution trailer hitch with 7-pin wiring harness. Other features include: a six-disc CD changer; front sport seats; convenience features like a digital compass and outside temperature gauge; the added safety of fog lamps and an auto-dimming rear view mirror with integrated back-up camera; and more. Tacoma 4x2 Access Cab (manual) starting at $21,355. Tacoma 4x2 Access Cab (automatic) starting at $22,355. Tacoma 4x4 Access Cab starting at $25,995. Tacoma 4x4 Access Cab V6 (manual) starting at $28,380. Tacoma 4x4 Access Cab V6 (automatic) starting at $29,340. Tacoma 4x4 Double Cab V6 (automatic) starting at $31,845.